Dr. Botanov has disclosed that he is employed by Behavioral Tech, LLC. Dr. Carlat has reviewed this article and has found no evidence of bias in this educational activity. Ms. Wilks has disclosed that she has no relevant financial or other interests in any commercial companies pertaining to this educational activity. Angela is a 27-year-old woman who was just discharged from the hospital after a suicide attempt following her second arrest for DUI. She says she only drinks on the weekends, but she recently lost her third job due to absenteeism. She doesn’t like AA, and she was kicked out of residential substance abuse treatment after the staff caught her scratching her arms with a paper clip. Her boyfriend also drinks, but she doesn’t want to leave him even though the Department of Family Services took temporary custody of their children after he was accused of domestic violence while both parents were intoxicated. Dialectical behavior therapy (DBT) is well-known as an effective treatment for individuals with personality disorders and for reducing suicidal behavior. But it’s also quite effective for addictions (Linehan M et al, Drug Alcohol Depend 2002;67(1):13–26). 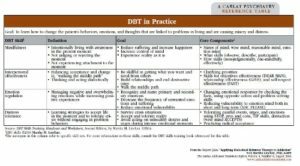 In this month’s expert interview, Marsha Linehan, the developer of DBT, provides a nice overview of the basics of DBT as applied to addictions. In this article, we’ll discuss DBT concepts in a bit more detail and help you apply these concepts to patients with substance abuse issues. Let’s start with DBT basics. DBT blends three philosophical and clinical traditions: behavioral science, Zen contemplative practices, and dialectics. The behavioral science part of DBT says that patients use ineffective behaviors, such as addictive behavior, to try and stabilize their emotions. Behavioral change strategies—think Pavlov’s dog—are key to decreasing harmful behaviors and increasing healthy behaviors. Zen practices underlie DBT’s mindfulness and acceptance skills, which help patients observe and understand their behaviors and emotions. The dialectical part of DBT is the most confusing for many, in part because the jargon may cause flashbacks to college philosophy classes. Dialectics means a process in which things that seem to be opposites of one another come together to form something greater (remember your professor saying “antithesis/synthesis”?). As applied to psychotherapy, dialectics means that patients must accept themselves as they are even as they simultaneously work toward change. Acceptance and change may seem antithetical to each other, but the genius of DBT is that it synthesizes these two crucial psychological processes. In standard DBT, individuals receive three modes of intervention: weekly individual therapy, a weekly skills training class, and between-session telephone coaching as needed. Of these three ingredients, the group skills training—taught in two cycles of a 24-week curriculum—provides crucial skills that influence therapeutic success. It is also essential for DBT practitioners to attend consultation team meetings where they confer with other DBT professionals on how to provide the most effective treatment. For an overview of DBT for treating suicidal behavior in BPD, see TCRBH, September 2013 (http://goo.gl/bgFBve). DBT for substance use disorders differs in a couple of important ways from standard DBT. First, an important part of DBT is a method of modifying patient behaviors called “contingency management.” This is a fancy way of saying “taking a time out.” (In DBT, contingency management is not the same as “motivational incentives,” in which prizes are given for negative drug tests or other positive behavior.) For example, when working with a patient with borderline personality disorder, if the patient engages in self-harm, the therapist might interrupt the therapy—often called a “therapy vacation.” This can work well in curbing self-harm. Second, DBT skills training for addictions includes additional skills that are built on top of the four original skill modules. The original modules comprise mindfulness, emotion regulation, interpersonal effectiveness, and distress tolerance (Linehan M. DBT Skills Training 2nd ed. New York, NY: Guilford Press; 2014), which are briefly reviewed in the “DBT in Practice” table below. Click here to view as full-size PDF. The skill set everyone should learn first is mindfulness, or being aware of the present moment without judgment. The goal of mindfulness is not to change a behavior or belief, but only to become more aware of it. For example, if Angela wanted to quit drinking, she would practice mindfulness by closely observing the sensations of consuming alcohol. Like many addictive behaviors, drinking is often performed habitually, without fully appreciating the experience. In DBT, drinkers learn to observe the taste and smell of alcoholic drinks, as well as their own bodily sensations when drinking. Often, this leads to the person noticing more aversive aspects of drinking as well—like nausea or a headache. This in turn may open the door for future behavior change. The second skill module is emotion regulation, which helps reduce vulnerability to emotions. For example, individuals learn to question their assumptions about a situation and see if their emotional reaction fits the facts; this skill is termed “check the facts.” We’ve observed that patients often use substances as coping mechanisms when they perceive a negative event has occurred. For example, Angela might believe she was slighted by a friend, and use alcohol to cope with her feelings of shame. DBT teaches her to review the facts of the situation before deciding if she was indeed slighted, or whether shame is the emotion that best fits the situation. If Angela finds her feelings don’t fit the facts, she’ll be less likely to take that drink. The third module is interpersonal effectiveness, which teaches individuals how to interact with others effectively—in other words, how to negotiate for outcomes they want without pushing people away or losing self-respect. Interpersonal effectiveness is key for individuals with addiction, since many of their social contacts may also be users. A common example is a patient who wants to quit using drugs, but her spouse also uses and isn’t ready to quit. DBT outlines a method for the patient to figure out if her chief goal is to maintain sobriety, the relationship, or her self-respect. Once these three main objectives are organized, DBT skills assist the patient in creating scripts to best achieve her goals. The final set of skills is distress tolerance, or getting through crisis situations without behaving in ways that make things worse. Distress tolerance skills are a last resort—they allow patients a little more time to resist a harmful urge to drink or to use. Skills include self-soothing activities, distractions from the urge, and changing physiology in order to change emotions. For example, Angela might have an argument with her boyfriend and experience a strong desire to escape painful emotions by drinking. If she’s so distressed that mindfulness and emotion regulation skills are too difficult to employ, we might suggest she change her physiology with intense exercise or activate her parasympathetic nervous system by simulating the dive response, a vagal maneuver that can slow the heart rate and calm strong emotions (Brown MZ et al, San Diego Psychologist 2012;26(6):14-16). Click here to view full size PDF. After they’ve learned the basic skills, we teach a special set of six addiction skills to patients with SUDs: dialectical abstinence, clear mind, community reinforcement, burning old bridges and building new ones, alternate rebellion, and adaptive denial (see the “DBT Addiction Skills table above for examples). Similar to the general DBT philosophy, dialectical abstinence brings together the need for behavioral change, such as abstinence, with the need for radical self-acceptance. How does this translate to clinical terms? If Angela relapses, you would encourage a non-judgmental problem-solving approach to getting back on the wagon. Clear mind is a synthesis of addict mind and clean mind. While addict mind includes thoughts, beliefs, and actions that occur under the influence, clean mind is a self-deceiving sense of immunity to relapse that can arise during a period of sobriety. Clear mind allows Angela to remain fully aware of her potential to relapse, even while she is abstinent. Community reinforcement includes learning how to actively seek out people, places, and activities that will reinforce non-addictive behavior. In Angela’s case, the skill of community reinforcement would involve learning how to, spend time with friends, family members, and others who will reinforce her decision not to use. Burning bridges and building new ones is a set of strategies that help patients remove triggers that cue them to use substances. These can be people, places, and/or things. There is also a set of strategies to manage cravings, such as urge-surfing, which employs the imagery of a wave as the urge to use is “surfed.” This is an important skill for managing craving, because eventually—hopefully—the urge will peter out (Marlatt G, George W. Relapse Prevention and the Maintenance of Optimal Health. The Handbook of Health Behavior Change. 2nd ed. New York, NY: Springer Publishing Co; 1998). Alternate rebellion helps patients find skillful and non-destructive ways to rebel against society that don’t involve substance use. This skill is particularly appropriate for individuals whose identity as an addict functions as a way to be different or unique. Alternative rebellion examples include dyeing your hair a wacky color or buying a controversial bumper sticker. Finally, adaptive denial is a means to deal with cravings and urges to use. Instead of denying outright that she’s craving a drink, Angela tells herself she’s craving mineral water or a good workout instead. Adaptive denial turns Angela’s self-deception into an asset (Dimeff L, Koerner K. Dialectical Behavior Therapy in Clinical Practice: Applications Across Disorders and Settings. New York, NY: Guilford Press; 2007). Does DBT work for SUDs? DBT researchers relentlessly seek empirical evidence to back up treatment claims, and so far they’ve found quite a bit of it. Several RCTs for DBT have been completed. Among patients with treatment resistant polysubstance dependence, those who received DBT were much more likely to attend a higher number of treatment sessions, to remain in treatment (64% versus 27%), and to achieve greater reductions in drug abuse throughout treatment (Linehan M et al, Am J Addict. 1999;8(4):279–292). In another RCT, BPD patients with opioid use disorder who received DBT and methadone replacement therapy maintained more urinalysis-confirmed reductions in opiate abuse during the last four months of treatment than controls who received methadone replacement plus treatment as usual (Linehan M et al, Drug Alcohol Depend 2002;67(1):13–26). After six months of DBT, Angela has reduced her drinking to less than once per month. She found a new job and has been meeting the terms of her probation. Her boyfriend continues to drink, but they are getting along better after he agreed not to drink at home. She feels less emotionally reactive, and she hasn’t self-harmed in over three months. Could your patients benefit from DBT? Maybe. It’s important to understand that DBT isn’t designed for any single diagnosis. Rather, it’s intended to be transdiagnostic and effective for patients who have severe difficulty regulating emotions and behavior. Since this applies to most addicts, DBT can be a good option for substance-abusing patients with comorbid mood or behavioral problems, or for patients who don’t respond to more traditional addiction treatment. For more information about DBT-SUD, read “Dialectical behavior therapy for substance abusers (Dimeff L and Linehan M, Addict Sci Clin Pract 2008;4(2):39–47).